biz-E-stampers: A Lot of Santas ! A Lot of Santas ! 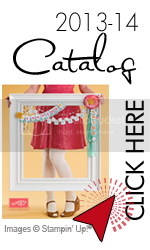 I have 9 days left before I leave for the Stampin'Up convention in Salt Lake City, Utah. This year there are two of my downlines going, Debi and Michelle. Swapping card fronts or 3D items is part of the fun. Since, most demonstrators are thinking fall and holidays I decided to concentrate on Christmas. The above photo shows the 25 "WOW" swaps I made. 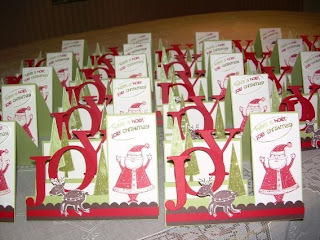 I don't know what I was thinking stamping and cutting 75 trees, 25 Santa's and reindeer. They really are cute but I'm really glad I got them done and can move on to another project for convention. Tomorrow will be our last weekly special for Stampin'Up. This week was the fire rhinestone brads 30% off. You have until 11 a.m. Monday morning to place an order.